One of the best sessions I went to at the Gartner Data Center conference last week, was entitled Extreme Data Centers – Attaining Massive scalability – in the minimum space at the lowest cost. The talk was given by David Cappuccio who is a managing vice president and chief of research for the Infrastructure teams with Gartner, responsible for research in data center futures, servers, power/cooling, green IT, enterprise management and IT operations. 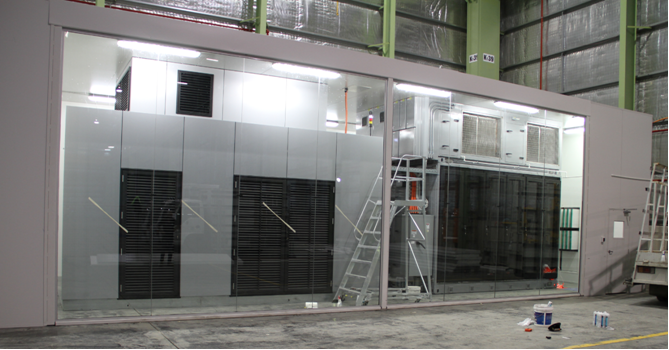 Dell's Modular Data center, mentioned in David's talk, a few days before it went live at Tier 5 in Australia. He felt the drawback was that there weren’t any reference accounts: he mentioned HP at Purdue and “some company down in Australia” (which dear readers is the Dell MDC down at Tier5, pictured above). This entry was posted on Tuesday, December 14th, 2010 at 8:53 pm and is filed under Uncategorized. You can follow any responses to this entry through the RSS 2.0 feed. You can leave a response, or trackback from your own site.